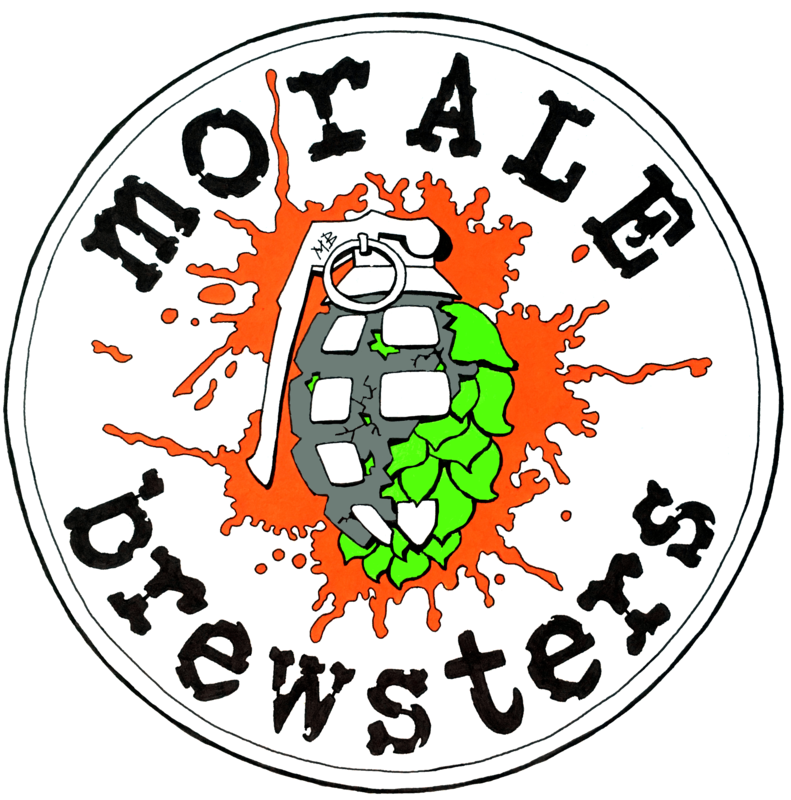 morALE Brewsters, a nanobrewery located in Oromocto, NB, will be holding a launch party this Friday at Griffin’s Pub. We caught up with co-owner Rémi Lévesque to learn more about this military-owned brewery, their beers, and plans for the future. morALE brewsters is a team of 4 serving military members and one military wife. Rémi Lévesque, Nicholas Matheson, Bruno Plamondon, Samuel Roy and Johanna Osborne. We are from different areas within Canada, New Brunswick, Nova Scotia, and Quebec, but some of us have been in Oromocto for over 15 years. Seeing as we are five individuals, we all have a different story. But in the military culture, beer calls, special events or even payday were always all good reasons to share a cold one with friends. Funnily enough, I remember when Jo and I started dating, we both liked beer, and together discovered micro brews initially through Picaroons‘ Simeon Jones and Irish Red and I think this was a turning point for myself. There was that sweetness I was not able to describe but that I was fascinated with. At that point I was making wine and I figured that it would be great to try to make beer too. So like many, we started with beer kits and progressed all the way to all-grain brewing. And that’s when I realized that I knew nothing! There is so much to learn and to experiment with. I remember in December 2015, Bruno and I were talking about homebrewing at work, he suggested that it would be fun to gather a small group of craft beer fans to start brewing together. To experiment with different recipes with the idea/hope that if we come up with some good ones, we could transition into a real side business. So we approached some friends and I told my wife the news. By January 2016, we officially sat down and all 5 joined together. In the summer of 2017, we were very happy with our recipes and we decided to get more serious equipment and here we are today! The real reason I think is that we observed the reactions of our friends when we were sharing our beers and their comments were so positive that it convinced us to try one step closer to a real brewery! We definitively have a soft spot for our military background. Having all our beer names related to some military expression or slang within the community. We started with “Brewed by the troops for the troops” but we wanted to share our culture with the rest of the population too. Knowing that at any point in life, everybody needs a morale boost!! And there it was, morALE brewsters! Good beer, shared with people that understand that we don’t need to take ourselves too seriously all the time. Can you tell us about the beers you plan on offering? We are starting with a Cream Ale (Cornflake) because that seems to be the fan favourite and the perfect introduction for us. We actually have 7 registered styles of beer available at this time, that we will soon be able to offer by the keg, limited to local pubs in the Oromocto area. Those include a Red IPA (Red Over Blue), an APA (Hops Honour), a Brown Ale (Boot Camp), a Milk Stout (Bug Out), a Belgian Blonde (PTE Bloggins) and a Seasonal Cucumber Wheat Ale (9ner Domestic). We kept our list within classic styles that we were confident to reproduce with consistency. What are your plans for distribution (aka, how can people enjoy your beer)? At this time, it is a nano brewery right in Jo and mine’s basement! For now, all we are able to offer is kegs. Local pubs in the Oromocto area is where we want to be involved in the community. Our first account will be starting Friday August 31st, and will be at Griffin’s Pub in Oromocto, NB. Being very new in this venture, we want to start slow and make sure that we will be able to provide to those we offer our product to. Having an actual taproom in Oromocto, NB to serve Growlers and enjoy a pint on location, would be a great next step for us. This includes the expansion of our equipment. We would love to eventually have our product in cans to be seen on the shelves beside all the other great craft breweries. Hopefully we can manage our expansion to occur within the next 3 years. Most likely, our capital will dictate a lot of our developing schedule. Plus add 30%, right?!! We are currently brewing on a 1 BBL (120 litre), all electric system, with 2 fermenters and one brite tank. We fill and sell in 19 litre kegs. Our expected output for our first year is 5000 litres. Care to share some info on your brewing history? So I guess you could say, our history could be described as countless hours of trial and error! We are beer fans that is for sure! In the specifics, it is hard for me to pin point a style or a brewery in particular. All of them! I think that should be the goal, to try them all! Anything else you’d like to share, we’d love pass it along. We are very happy to be entering the brewers community and we can’t wait to get to know you all and get your feedback! Thank you to Rémi for spending some time with us, and getting us up to speed with morALE Brewsters. Drop by Griffin’s Pub in the CANEX Mall at 42 Broad Rd in Oromocto from 7PM for their Launch Party to try their Cornflake Cream Ale, and meet the folks behind the brewery. Stay up to date with the latest releases and goings on at their Facebook Page and Website (launching soon). Friday Wrap-Up for August 24, 2018 – News from Boxing Rock and Local Source, Niche, Breton, Brightwood, Flying Boats and More!! With the weather forecast looking pretty dang fine for most of our region, and now that we seem to have finally reached the magical, “hot days, cool nights” portion of the summer, all we need is for our local beer producers to step up and keep things interesting. And wouldn’t you know it, it appears they have! Read on for the latest beer news from around Atlantic Canada, including plenty of new and re-appearing beers, a new venue in Halifax, and not one, but TWO homebrew competitions. Halifax fans of local beer got some great news this week, as Boxing Rock unveiled their plans in the big city. 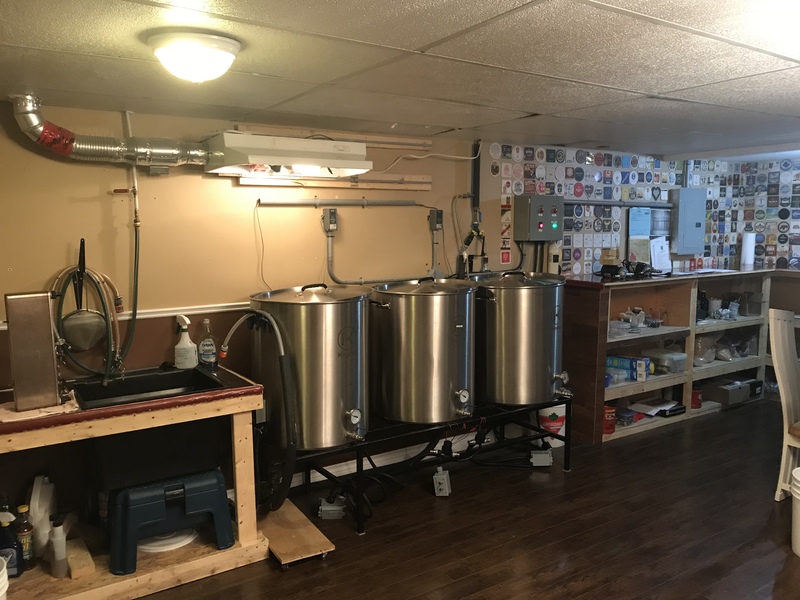 The Shelburne brewery has opened up Test Kitchen, a pilot brewery in the Local Source Market space at 2530 Agricola Street. Brewing on a 120 litre (1BBL) system (with a pair of fermenters), this smaller brewhouse will allow them the opportunity to test out some brand new and innovative recipes, before possibly scaling them up to a full-sized batch of several thousand litres. They anticipate brewing a couple of times per month, with Tuesday’s inaugural brew being a collaboration with two-time Black Box Challenge winner Brian Harvey. Brewing onsite also gives Local Source the ability to sell Boxing Rock beer, as an extension of BR’s Retail license. With a dozen different full-time, seasonal, and test batch beers available in bottles, growler fills using their futuristic-looking Pegas CrafTap system, and a couple on tap at adjoining Lion & Bright, Agricola just got a little more South Shore. To accomodate all of us thirsty visitors, they’ve extended the hours of the shop a little later in the evening: M-W 9-7, Th 9-8, F 9-9, Sat 10-9, Sun 10-6. The beers are available at their retail location now, and they are holding a Grand Opening next Saturday, September 1 to celebrate. From 10AM, the first 250 folks to visit the location will receive a free limited-edition Boxing Rock growler (just pay for the fill). This is your key to savings, as it give the owner $2 off each 1.89 litre fill in both Halifax and Shelburne, for the life of the growler. You can also tour the brewery space out back to see what’s bubbling away, and maybe get a hint of what’s coming next. For those unable to attend next Saturday’s event, they are holding an online contest for their followers, you can learn more here. Congratulations to the Boxing Rock Crew! Hanwell’s Niche Brewing is back with a brand new beer this week, the latest object of their love and appreciation of traditional styles and modern ingredients. New World is a Saison fermented with The Yeast Bay’s Saison Blend, which features two clean-fermenting Saison yeasts, and marks the first time they’ve used this blend. The simple malt bill consists of Pilsner and Wheat, with the yeast offering some spiciness and light minerality. The hops took a decidedly updated turn, with Citra and Ekuanot used lightly in the boil (sub-20 IBUs), with a larger dry-hopping of the same for citrus and tropical flavours and aromatics to complement the yeast. Kegs of this 5.1% ABV have been delivered around Fredericton, Saint John, and Moncton, so keep an eye out for it as you hit the patios and barstools in the province this weekend. Looks like the third entry in Breton Brewing’s Sour Sessions popped up on tap earlier this week; the latest in their rotating-fruit kettle sours brew features the addition of kiwi and passion fruit puree. The low IBUs (4) and sessionable ABV (4.2%) allow you to be able to drink this one in quantity, so you can enjoy the “crushable tartness and fruity finish” in what’s left of our beautiful summer weather. Drop by the brewery for a pint or growler, or look for it at a few select accounts in Halifax (including the Stubborn Goat and Shuck Seafood + Raw Bar). Fresh off the opening of their expanded location and taproom earlier this month, Dartmouth’s Brightwood Brewery has a brand new beer to follow up with. The Little Lift is described by the brewery as a Session IPA, based at least in part on their The Big Lift IPA. Brewed with 2-Row, Munich malt, and a touch of Wheat, it was hopped late in the boil with Citra, Northern Brewer, and Palisade. Fermented with the East Coast yeast strain, it was then dry-hopped with more Palisade. Expect “lots of citrus aromas and flavours, with a crisp, full body” in this 5.6% ABV brew; drop by the new taproom to give it a try or fill up a growler. In Dieppe, New Brunswick, Flying Boats has decided to experiment a little, by launching a Test Pilot Series. The first beer in said series is Test Pilot No. 1 – APA, a “hop-forward” American Pale Ale that features large whirlpool and dry hop additions of Azacca and Citra, two very expressive American varieties. The 5.6% ABV beer is a deep golden colour, and has “intense, tropical and citrusy flavours and aromas, with a lingering, soft, citrusy finish”, according to the brewery. It’s been on tap for the last few weeks, and is now also available in cans at the brewery, select ANBL stores, and Picaroons retail locations. Looks like Good Robot has even more beer news than usual this week, to tag along with their Beta and Alpha releases. Let’s start with the “usual” – next Tuesday’s Beta will be Ringside Imperial, an Imperial Red Ale brewed with Pat King. Weighing in at 7.3% ABV and 42 IBUs, we don’t really have anything in terms of recipe details for you, but can confirm from GR that it’s a golden-amber coloured beer that leaves a “mild alcohol heat at the back of the palate”. As for next week’s Alpha brew, it’s the return of Leave Me Blue, the brewery’s award-winning 4.5% ABV Cream Ale. You’ll also see cans of El Espinazo del Diablo, their 5.7% ABV Mexican-style Lager with lime and jalapeno flavours, available as of today. As for the other Good Robot snippets, they’re releasing two other Beta releases on Sunday for Flavabot, their “All-Day Island Party” that will feature plenty of food, games, music, and, naturally, beer. Back to that, the first beer is Stag A Lee (6% ABV, 20 IBUs), brewed with toasted coconut flakes. They then took some more toasted coconut flakes and soaked them in coconut rum, before adding to the beer after fermentation was complete. They’re describing it as a “rich, dark, tropical Porter”. Next is Calypso Gator (5.8% ABV, 81 IBUs), a White IPA with “hints of pineapple, grapefruit, and mangoes, with a nice, hoppy balance”. Be sure to drop by the event on Sunday to give these new beers a taste, and take part in the fun! Do you remember the tasty, tasty release of Glou from Stillwell Brewing back in April? We sure do! It was a 6.2% ABV foedre-aged sour beer that had been aged on New York muscat pomace. In the forum of great news, bottles of Blend 2 of Glou will be released this Saturday at the brewery from 12-4 pm. The base beer for this blend is a sour that had been aging for almost a year in a foedre, atop the very same pomace used for Blend 1. Described as “floral and peppery on the nose, and deep and round in the middle, with a dry and snappy finish”, it sounds like they probably have another winner! Lazy Bear in Smiths Cove debuted a new beer during their Growler Night at the brewery Thursday. My Old Friend is the barrel-aged version of their Hello Darkness Dark Saison. Sitting for 6 months in Cabernet Sauvignon barrels, the beer picked up some vinous notes, as well as a touch of oak from the barrel itself, which complement the dark malt characteristics in the base beer. The resultant brew is 6.3% ABV, and will be available at the brewery and Annapolis Royal Farmers Market tomorrow, with a lone keg being tapped soon at Dartmouth’s Battery Park. TrailWay is bringing back an old favourite today, with a twist that they’ve brought to some of their other more-popular beers. DDH Dunder is a double-dry hopped version of their “Australian Pale Ale”, Dunder, a 4.8% ABV brew featuring Australian hop varieties. The extra dose of dry hops has increased the “overripe fruit, dank, extremely tropical” qualities in the beer, according to the brewery. You can find cans exclusively at the taproom as of today; it’s also on tap there, and will likely be at a few tap accounts around New Brunswick. We have two homebrew competitions to tell you about this week, so all of you amateur brewers, pay particular attention! The first is from Dartmouth’s Spindrift Brewing, whose competition is named “May the Best (Wo)Man-Darina Win!”. This competition is wide open to any style of beer, but offers a neat twist on traditional competitions: Spindrift wants to supply you with the hops! Wanting to shaowcase three new German hops, your $20 entry fee will include all of the Hallertau Blanc, Huell Melon, or Mandarina Bavaria you may need for your recipe. We checked, and they say there’s no limit to the amount of hops they’ll send your way! Other hops can absolutely be used in the recipe, but the new-world Germans should make up more than 60% of the total hop mass. The deadline to register is September 14th, and you will need to include your recipe plan with your application form, so they can prepare your hops in advance. The beers are due Friday October 3rd, with the judging by Spindrift employees and BJCP judges happening before the Gala and bottle share on October 13th. The top 3 beers will receive prizes, with the top brewer having the opportunity to recreate their recipe on the Spindrift pilot system for later release, and plenty more hops and SD swag. Grab the Poster, Info Sheet, and Recipe sheet now. The second homebrew competition is being held this fall by Quidi Vidi Brewery, in collaboration with the Newfermenters Homebrew Club. QV is looking to celebrate the great, and growing, homebrew community by releasing a 4-pack of amateur-brewed beers across the province. There are no restrictions on the style you can brew, and entrants will be welcomed to the brewery to present your recipe, beer, and passion for the craft. Submissions are due October 20th, with the presentations and Awards happening at a later date. The winners’ pack will be available in the NLC in early 2019. You can learn more here, and by emailing your intent to enter (and ask questions) to newfermenters@gmail.com. Speaking of Quidi Vidi, they are looking for an experienced Operations Manager to join their team, to oversee all of their production. Managing the brewing, packaging, storing, and distribution of their beer is a monumental task, so they are looking for an exceptional candidate to take this on. Supply-chain management experience is an asset, as well as previous brewery and management experience. Check out the full posting here, and fire an email to jobs@quidividibrewery.ca by September 6th to apply. Just one event to tell you about this weekend, but don’t be shy: get out and enjoy the beautiful weather while it lasts! Fredericton’s The Joyce Pub is holding their second annual sour beer event, Tarte Diem II – 2 Sour 2 Acidulous, tomorrow, August 25th. At least 25 of the bar’s taps will be pouring sour beers from breweries in NB, NS, and PEI; for a sneak peek, check out this photo. There’s no charge to attend the event, just plan your attack and order by the pint or flight! It starts at 3 pm when the pub opens, and goes all day. As always, they’ll be serving their full menu to accompany your beers. In Clarenville, Newfoundland, the Newfoundland Cider Company has released their widest variety of blends so far. As part of their Forager series, they are now carrying a limited supply of Elderflower & Rhubarb, Wild Cherry & Rose, Lavender & Black Currant, Lilac, and Spruce Tip blends. In addition, growler fills of their Farm house and Cloudy Scrumpy, as well as 375 ml of Wild & Dry and Cloudy Scrumpy are also available. Drop by their spot at 24 Balbo Drive today and tomorrow, open Friday 1 – 6PM and Saturday 1 – 5PM.